As Week 5 of the NFL season came to a close with the final of the Vikings-Bears Monday night game, it’s time to take a look at how the league’s offensive lines have stacked up. 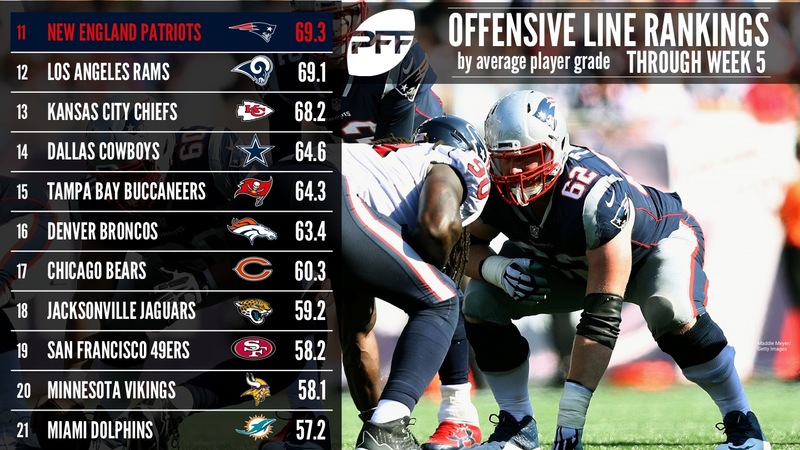 While we’ve shown their efficiency as a unit in terms of strictly pass-blocking, now that the dust has settled on Week 5, we at PFF can now depict just how well each offensive line has performed at every facet of the game. The Eagles offensive line is anchored by center Jason Kelce, who is having the best season of his career to date and ranks second among centers with an overall grade of 91.8, while he leads players at his position with a run-blocking grade of 96.6. Kelce plays a crucial role in a Philadelphia offense that relies heavily on outside zone runs; the 56 outside zone plays the Eagles have run this season ranks third in the NFL and is more than one third of all their run plays so far. 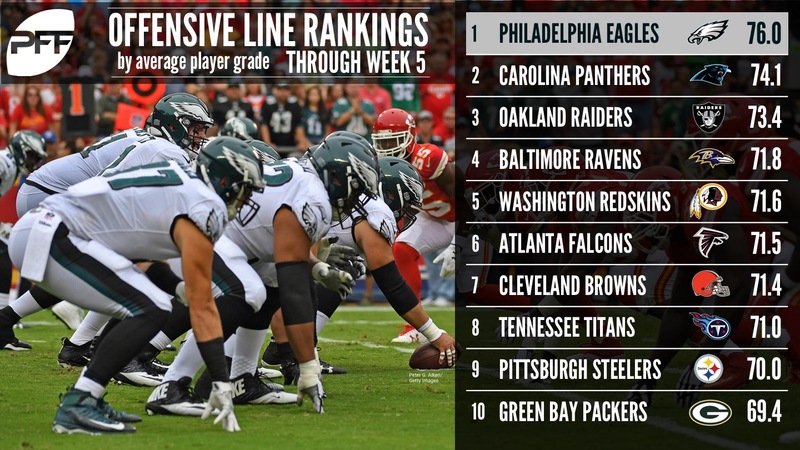 Furthermore, the Eagles’ current starting offensive line has combined to allow just one sack all season; they rank third in pass-blocking efficiency with a rating of 85.0. The play of the Panthers offensive line has been one of the positive surprises of the season, especially with the injury to center Ryan Kalil. Backup center Tyler Larsen has been playing well as he proved to be a force in the running game and is currently Carolina’s highest-graded run-blocker, even having played fewer games then the other offensive linemen. Free agent acquisition Matt Kalil has been playing better in recent weeks — he has not allowed a single sack or quarterback hit in the last two games after surrendering four sacks in the first three weeks. The Panthers are at their most successful when running a man-blocking scheme this season, as they average 2.42 yards before contact on these runs, third-highest in the league. Even though the Raiders offensive line has allowed 10 sacks on the season (tied for the fourth-most the league), it has been the best pass-protecting unit in the NFL. They have just allowed 14 pressures on top of the sacks – and no quarterback hits – which results in a total of 24 pressures surrendered on the season, fewest in the NFL by a significant margin. While currently no one plays at an elite (grade of 90 or higher) level on the line, everyone has had an above-average season so far, led by center Rodney Hudson‘s grade of 83.0 with no pressures allowed all year. While guard Marshal Yanda’s injury is among the most devastating injuries for an offense this season, the Ravens are compensating for it with strong performances from their tackles and their center. In fact, center Ryan Jensen ranks third in the NFL with an overall grade of 86.1 as his run-blocking grade of 88.8 is also third at his position. Furthermore, right tackle Austin Howard is having one of his best seasons as he has yet to give up a sack and ranks first among tackles with a run-blocking grade of 87.3. As a result, the Ravens are having success running the ball, ranking fifth in the NFL with an average of 2.10 yards before contact on carries. Even though LT Trent Williams is not playing at the level that he did last season when he was the best offensive tackle in football, no one is playing well below average on a line that does not seem to have a weak link at this point. The unit ranks eighth in pass-blocking efficiency with a rating of 81.1, allowing just four sacks on the season, tied for the sixth-fewest. In addition, they have been among the best run-blocking units as well, which is highlighted by the fact that their runners get 2.17 yards before contact, fourth-most in the league. The Falcons offense remained one that relies heavily on outside zone runs – and play actions off of it – even with the departure of former offensive coordinator Kyle Shanahan. They have run 54 such plays, tied for the sixth-most in the league. They average the ninth-most yards before contact on these runs with 1.98 yards, which is largely due to center Alex Mack. The former Cleveland Brown is having his best season to date, which says a lot after the type of season he had in 2016. He ranks first among centers with an overall grade of 93.9, and he has surrendered just one pressure all season to lead his position with a pass blocking grade of 85.4. People had high expectations for the Browns offensive line coming into the season due to the additions of guard Kevin Zeitler and center JC Tretter. However, it’s incumbent starters LT Joe Thomas and LG Joel Bitonio who have been playing the best football on team. Thomas picked up where he finished last season and currently has a grade of 88.9, which is the highest among all offensive tackles as he has not allowed a single sack this season. Nevertheless, Cleveland will be looking to improve in the running game as currently they are allowing just 1.10 yards before contact on runs, which is the ninth-fewest in the NFL. The Titans offensive line was among the best last season, anchored by young offensive tackles LT Taylor Lewan and RT Jack Conklin. However, while Lewan is still playing at a high level, Conklin’s game has considerably dropped off as he already has allowed 14 total pressures compared to just 31 in all of 2016. The rest of the line has been playing well and the entire unit has been among the best when it comes to run-blocking. They currently rank second in the league behind only Kansas City with 2.73 yards before contact. Furthermore, they average 4.6 yards before contact on power scheme runs, which is the second-highest in the league as well. Similar to last season, the Steelers rank fifth in pass-blocking efficiency with a rating of 82.6 as they have allowed 46 total pressures on 205 passing plays so far this season. However, they have felt the absence of right tackle Marcus Gilbert, one of the unit’s better players, over the last few weeks. A bright spot , and reason for their ninth overall ranking here, is right tackle David DeCastro, who is currently having the best season of his career, ranking first among guards in the league with an overall grade of 88.8. The Packers are heavily impacted by the fact that they have had to play without LT David Bakhtiari, one of the best pass-blockers in the entire league, in recent weeks. Green Bay had to introduce backup lineman Justin McCray to the starting lineup and, while he did not disappoint at left guard last week, he struggled in his first three games at right tackle. The Green Bay offensive line has already surrendered nine sacks and ranks just 19th in pass-blocking efficiency with a rating of 77.8. That said, this is a unit that should see a lot of improvement once everyone is healthy again. While the Patriots had one of the best offensive tackle tandems and relatively struggled on the interior in 2016, it has been mainly the opposite this year. Right tackle Marcus Cannon has already given up four sacks this season, which is one more than what he allowed in all of 2016 while left tackle Nate Solder is having the lowest-graded season of his career, currently sporting an overall grade of 47.8. However, their work in the running game is making up for this, along with the performance of the interior offensive line as RG Shaq Mason is ranked fourth among guards with an overall grade of 83.6. The Rams offensive line could probably get an award for most improved unit in the NFL. That has a lot to do with the free agent acquisition of veteran left tackle Andrew Whitworth. The former Cincinnati Bengal is the highest-graded player on the line with a grade of 84.4, fifth among offensive tackles in the league. While Whitworth gave up four total pressures, including a sack, against Seattle in Week 5, he allowed just one total pressure in the first four games. As a comparison, Greg Robinson – who played left tackle for the Rams last season – gave up four pressures in just the first game of the 2016 campaign. The Chiefs offensive line right now is heavily hurt by injuries, missing its starting center and right guard. Even though Zach Fulton is playing well at center, they have not found the solution to replacing Laurent Duvernay-Tardif. Furthermore, left guard Bryan Witzmann ranks just 58th among guards in pass-blocking efficiency as he has surrendered 14 total pressures on 187 pass-blocking snaps this season. The unit, however, makes up for its pass-blocking deficiencies with its strong run-blocking, leading the league with 2.79 yards before contact, though it struggled in that area in their last game against Houston, averaging just 0.57 yards before contact in that game. Even though Dallas has been among the best offensive lines in recent years, they have yet to reach that level this season and it is largely due to the play of the new pieces on that line. Left guard Jonathan Cooper and right tackle La’el Collins currently rank 62nd and 56th, respectively, at their positions in PFF grades, respectively. Nevertheless, single games can heavily influence rankings this early in the season and the Cowboys offensive line had one of its worst games in recent memory against Denver in Week 2 when it allowed 23 total pressures – the most by any offensive line that week – on 55 passing plays and had the third-worst pass-blocking efficiency rating that week. Tampa Bay’s offensive line has been one of the best when it comes to pass protection this season, allowing just 32 total pressures on 167 passing plays, which leads to the second-highest pass-blocking efficiency rating in the NFL with 85.2. The unit is anchored by right tackle Demar Dotson who is having his best season since 2013 and currently ranks third among tackles with an overall grade of 86.5, including a pass-blocking grade of 87.2, which is the second in the league. However, the rest of the offensive line has struggled at times, especially when it comes to run-blocking as they rank 15th in the NFL with 1.62 yards before contact. Denver’s offseason moves have already started to pay dividends on the offensive line as free agent acquisition Ron Leary and rookie left tackle Garett Bolles have both played well in the first quarter of the season. Leary is the only offensive guard in the entire league to log more than 40 pass-blocking snaps and not allowed a single pressure, and he’s well clear of that line at 132 pass-blocking snaps so far. The rest of the line has been much better in run-blocking, ranking just 25th in pass-blocking efficiency with 50 total pressures on 152 passing plays. The unit ranks sixth in yards before contact on inside zone runs with 1.92 yards. While left tackle Charles Leno Jr. is having a solid season and has earned an overall grade of 72.1 so far, the other four offensive linemen are either having the lowest-graded seasons of their careers or at least their lowest in some time. The biggest disappointment has been center Cody Whitehair, who went from being one of the best centers in the entire NFL in his rookie season to earning a grade of 43.7 through his first five games, which ranks 28th among centers. Whitehair has the lowest pass-blocking efficiency among all centers with 93.8 as he has allowed 11 total pressures on 132 pass-blocking snaps. Even though Jacksonville‘s offensive line has allowed just two sacks – tied for the fewest in the NFL – they have surrendered 39 total pressures, including 10 quarterback hits. In fact, the 10 hits are tied for the seventh-most in the NFL and the Jaguars have a pass-blocking efficiency rating of 80.3, which is the ninth-highest in the league. With the exception of injured center Brandon Linder, the Jaguars offensive linemen have not been playing well overall as they have struggled in pass protection and run-blocking. Although the Jaguars ran the most inside zone runs with 75 through the first five weeks, they average just 1.48 yards before contact on these runs, which is only 18th in the NFL. The 49ers’ offensive line has taken a big step forward from last season as they went from having the 29th-best pass-blocking efficiency rating in 2016 to ranking sixth this year with 48 pressures allowed on 211 pass-blocking snaps. The unit is anchored by its two tackles, Joe Staley and Trent Brown, who both are among the top 17 offensive tackles this season. Furthermore, San Francisco is one of only three teams that averages more than 2.0 yards before contact on inside zone runs and actually lead the league with 3.10 yards before contact on these runs. The 49ers’ weak spot is the interior offensive line where left guard Laken Tomlinson and center Dan Kilgore rank 63rd and 32nd at their respective positions. The Vikings offensive lines is one of the units that has stayed healthy so far, with its starting five offensive linemen playing in 1,636 of a possible 1,650 snaps this season. Minnesota has actually shown a big improvement in pass protection from last season, ranking 15th in pass-blocking efficiency this year compared to just 23rd a year ago. However, with the exception of left tackle Riley Reiff and right guard Joe Berger, they have struggled to run block well, as they rank just 13th in average yards before contact on inside zone runs, their most heavily used run-blocking scheme. Miami’s offensive line has been slightly better in pass protection than last season as they were able to improve their pass-blocking efficiency rating from 74.6 (25th in the NFL) last season to 75.9 (tied for 20th in the NFL) in 2017. They have given up 45 total pressures on 145 passing plays in the first four games. However, their run-blocking has not improved as they have struggled in this aspect, especially on the interior. They average 1.06 and 0.12 yards before contact on inside zone and outside zone runs respectively, which are their two most frequently used run concepts. Overall, Miami’s running backs average just 0.66 yards before contact, which is the fourth-lowest in the NFL. 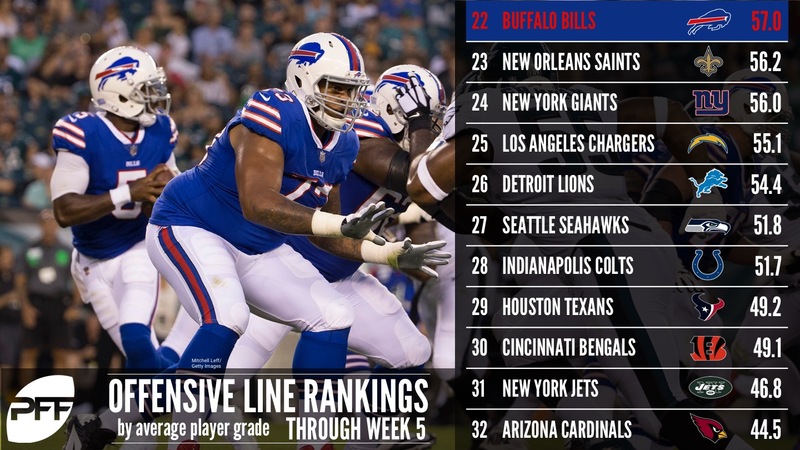 While Richie Incognito is among the top 10 guards in the NFL once again, the rest of Buffalo’s line has been unable to come near to playing at his level. The unit has played well in pass protection as they rank seventh in the league with a pass blocking efficiency rating of 82.2, having allowed just 38 pressures on 171 pass blocking snaps. However, the issues come with run-blocking, where basically everyone but Incognito has a poor grade so far. The Bills run more outside zone plays than anyone in the league, leading the NFL with 76 attempts, but they rank just 17th in yards before contact, averaging just 1.06 yards on these plays. Even though left tackle Ryan Ramczyk is playing relatively well for a rookie and Zach Strief is back at right tackle after an injury, the Saints offensive line struggled in the first quarter of the season and it is mainly due to the interior offensive line. Center Max Unger is currently PFF’s 31st-ranked center with a grade of 39.2 and is having his worst-graded season to date, mainly due to his run-blocking. Also, Unger is on pace to allow 16 total pressures this season, which would be the most pressures he has given up since his rookie season in 2009. In addition, New Orleans averages just 1.20 yards before contact on runs, which ranks 22nd in the NFL. The Giants offensive line was a question mark coming into the season and we have not seen a lot of improvement from last season. The unit has allowed 10 sacks so far, tied for fourth-most in the NFL, and ranks 22nd in the league with a pass-blocking efficiency of 75.8. Making matters worse, they are missing their best offensive lineman in Weston Richburg, which leads to five below-average performances on the offensive line. On the Giants’ most frequently used run play – the inside zone – they are one of just nine teams averaging less than a yard before contact on inside zone runs. While the Chargers allowed just two sacks on the season – tied for the fewest in the NFL – this is largely due to Philip Rivers leading the NFL with 14 throwaways, turning potential sacks into incomplete passes. In fact, the Chargers have given up 64 total pressures on 201 passing plays and rank 20th in the NFL with a pass-blocking efficiency rating of 75.9, which is actually an improvement from their rating of 70.3 last season, which ranked 31st. Even though left tackle Russell Okung is having his best season since 2012 and center Spencer Pulley has been a positive surprise, the other three players on the offensive line have all graded below 41.0 so far. The Lions signed right guard T.J. Lang and right tackle Rick Wagner in the offseason to strengthen the offensive line, and while Lang and Wagner rank third and 11th at their respective positions, the rest of Detroit’s line has not allowed the unit to take a step forward in 2017. Former Rams left tackle Greg Robinson was forced to start due to the injury to Taylor Decker, and he has not performed particularly well, ranking as PFF’s 68th-graded offensive tackle so far. Robinson has surrendered 21 total pressures in five games, the sixth-most at his position. In terms of blocking for the run, Detroit runners average just 0.61 yards before contact, which is the third-fewest in the NFL. The Seahawks didn’t do much this offseason to address their struggles on the offensive line, and also lost left tackle George Fant for the season. Considering this, it is no surprise that the unit ranks 29th in the NFL in pass-blocking efficiency rating with 69.4, having allowed 83 total pressures on 209 passing plays this season. Furthermore, left tackle Rees Odhiambo is tied for the second-most total pressures surrendered among tackles this season with 30 and ranks 66th among 69 qualifying tackles with a pass-blocking efficiency rating of 88.9. However, the Seahawks have seen success in the running game as they rank 15th with 1.26 yards before contact on outside zone runs, their most frequently used run concept. The Colts rank 27th in pass-blocking efficiency, allowing 60 total pressures on 175 passing plays and while it’s an improvement from 2016 when they were last in the category, this might not comfort Colts fans. The return of center Ryan Kelly should help the unit, but so far left tackle Anthony Castonzo has been the only bright spot on the line — he’s actually tied for the highest run-blocking grade among tackles in the NFL at 87.3. In addition, the Colts overall struggle in the running game. With 40 outside zone plays this season – which is more than average – Colts running backs average minus-0.63 yards before contact on these plays, by far the fewest in the NFL. 2017 didn’t start well for the Texans offensive line, as the unit surrendered 31 total pressures in their first game against Jacksonville, which is more than what Oakland’s offensive line allowed in the first five games of the season. While it has been slightly better since, Houston still has in its lineup two of the 10 lowest-graded guards in the NFL. Left guard Xavier Su’a-Filo also ranks 67th among guards in pass-blocking efficiency as he has given up a league-high four sacks, while right tackle Breno Giacomini currently ranks last among tackles with a pass-blocking efficiency of 87.2, surrendering a league-high 31 total pressures, including four sacks, on 189 pass-blocking snaps. The Bengals let left tackle Andrew Whitworth and right guard Kevin Zeitler walk in free agency and are paying the price for this so far this season. All starting Cincinnati offensive linemen are grading below 50.0 this season with the exception of left guard Clint Boling. The unit has not been at their worst in pass protection, ranking 24th in the NFL with a pass-blocking efficiency of 74.4 by allowing 59 total pressures on 181 passing plays. However, they are the worst run-blocking unit in the NFL to date as they struggle to get anything going on the ground. This is highlighted by the fact that they average just 0.42 yards before contact on all runs, the fewest in the NFL. The Jets offensive line is has allowed 10 sacks so far this season, tied for fourth-most. But overall, their offensive line has not been that bad in pass protection as they rank 18th in the league by allowing 45 total pressures, including the 10 sacks, on 168 pass-blocking snaps. However, they have been unable to replace center Nick Mangold so far as Wesley Johnson currently ranks 34th among 34 qualifying centers with an overall grade of 32.4. The Jets offensive line has also struggled in the running game as they average just 1.02 yards before contact on inside zone runs, their most frequently used run concept. While Arizona’s offensive line gave up by far the most pressures this season at 102, it’s unfair to note that without also noting the unit has also faced the most passing plays with 247. Nevertheless, Arizona still ranks 31st in the NFL with a pass-blocking efficiency rating of 67.7, better than only the Texans. It is difficult to single out weak links, as seven different Cardinals players have allowed at least one sack and four total pressures this season. Still, the Cardinals’ two tackles, Jared Veldheer and John Wetzel, have allowed the most pressures on the team as they combined to give up 57 total pressures this season, which is more than what 20 teams have combined to allow so far. While center A.Q. Shipley ranks 27th among centers, no Arizona guard or tackle ranks in the top 50 at his respective position.